I've implemented a tractor beam in a mission I'm working on, and thought I would post it here as a stub that others can use in their missions. I'm pretty sure a tractor beam function has been implemented by others before, but in this case I've managed to create a graphic. The graphic consists of a custom mesh, which is basically just a wedge shape pointing at the tractored ship, and the "greenBullet" texture in stock Artemis. Yes, that is the Enterprise towing the Battlestar Galactica. The image doesn't show the rotation of the graphic very well, it is spinning fast enough that there is a double image, like the tractor beam of the base. It looks quite impressive in action. To use this, just download the zip file and install in your Artemis folder. It will add the "tractorbeam.dxs" mesh to the dat folder. You can move it to another folder if you like. At the top level of the installation will be a file called "tractor_beam_stub.txt". It contains the code that you will want to copy into your mission. You should define the code for each ship you wish to tractor. The tractoring ship will activate the tractor by flying to the other named ship and coming to a stop with shields down. If the other ship is less than 600 units away, the tractor beam will activate. The other ship will also have to be moving at less than half speed. (not at Warp) To shut off the tractor beam, simply raise shields. Will try it in my next mission!!! That's brilliant! 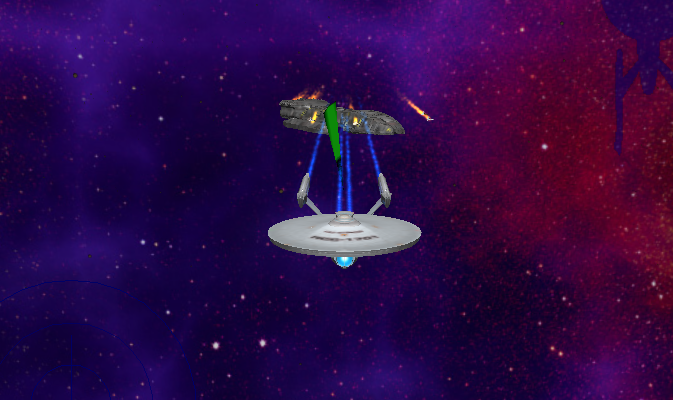 I've been using tractor beams in a couple of missions but never thought of using a mesh to create a visual effect. It was easy enough to make, but I took some time to fiddle with scaling and get it just right. It should work fine with the stock ships, or any custom ships of about the same size. I'm sure anybody could have done the same thing, but here I've managed to do most of the work. The "greenBullet" is also perfect for the texture. I'm fairly certain it's part of the stock installation, but do let me know if it isn't. Thanks for sharing this. So, it looks like the you had to set the tractor beam to auto lock when the two ships are stopped, with shields off, and within 600km. I take it that other methods like listen-for-keystrokes didn't work well? Yeah, I was trying to avoid using keybinds. The code stub could be modified to make use of a keybind or Comms button, though.